This article examines the biology and management of spotted wing drosophila (SWD), Drosophila suzukii, within organic farming systems. Information compiled in this article has been adapted from relevant publications and a recent two-year, multi-university study funded by the UDSA Organic Agriculture Research and Extension Initiative (OREI). 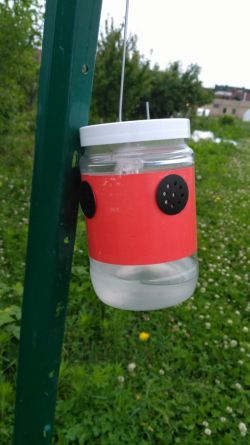 More information on this project can be found on the Organic Management of Spotted Wing Drosophila Website or the recording of the recent webinar about SWD from February 2017. Native to eastern Asia, SWD is an invasive fruit fly first discovered in 2008 on mainland United States. Mature adults are approximately 2.5mm in length, similar to a single raspberry drupelet. Male SWD have a distinguishable black spot on the first vein of their wings (Fig. 1a), and a black band on the first two tarsal segments of their forelegs. While harder to identify, females have a serrated ovipositor (Fig. 1b). This allows SWD to lay eggs within intact, still-ripening fruit. Figure 1. Adult Spotted Wing Drosophila. (a) Male SWD; (b) Close-up of serrated ovipositor on female SWD. Photo Credits: (a) G. Arakelian, Oregon Department of Agriculture; (b) M. Hauser, California Department of Agriculture. There are several fruit fly species with similar morphologic characteristics to SWD, most notably Drosophila subpulchrella, which also has dark wing spots. However, this fly is not present in the United States. While a specialist is typically needed for conclusive identification, a grower can reasonably identify SWD caught in traps using the reference traits described above. The common fruit fly, Drosophila melanogaster, is native to the United States and doesn't pose a significant economic threat to fruit growers. This is because it can only lay eggs in fruit that is either previously damaged or overripe, and thus already unmarketable. Due to the serrated ovipositor, SWD can pierce into the developing skin of intact fruit. This simple morphologic difference is why SWD poses such a threat to fruit producers nationwide (Fig. 2). Figure 2. 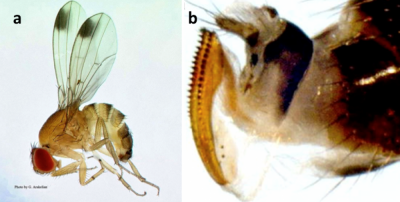 A comparison of ovipositors between D. melanogaster and SWD. Photo credit: M. Hauser, California Department of Agriculture. Adult SWD prefer relatively cool and humid environments. They are most active at dawn and dusk, at temperatures ranging between 59 and 70 degrees Fahrenheit. As the end of the field season nears, SWD adults emerge as winter morphs, with different morphological characteristics. The bodies of winter morphs are distinctively darker in color, with larger wings. Research is ongoing to determine the ability of winter morphs to overwinter at cold temperatures and to travel long distances for migration. Adult SWD prefers underripe, developing soft-skinned fruit for laying eggs. This includes raspberries, blackberries, blueberries, cherries, strawberries, and dozens of wild fruits found throughout the country. Asplen et al. (2015) provides a thorough description of the SWD life cycle: female SWD lay their eggs inside the fruit, which then develop into first, second, and third larval instar phases before pupation. 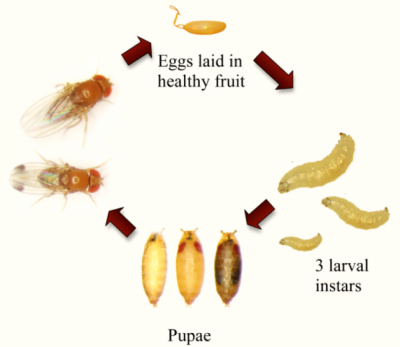 Pupae can develop partially or completely outside of the fruit before emerging as adults (Fig. 3). Development rate is dependent on temperature, but a complete life cycle can occur in as little as 10 days, with up to 13 generations in a single field season. Adult female SWD are capable of laying over 300 eggs in a lifetime. Figure 3. SWD life cycle. Photo credit: UMass Extension. Initially, SWD infestation within fruit can be difficult to identify. Seemingly intact fruit will have an oviposition scar on the skin, with breathing tubes from the SWD egg extruding from the position of the scar (Fig. 4a). Eventually the area around the scar becomes soft and sunken as the larvae develop (Figs. 4b & 4e). Fruit will commonly fall off of the plant by the time pupation occurs, and can break apart when handled (Figs. 4c & 4f). SWD development within fruit occurs between 43 and 89 degrees Fahrenheit, with optimum development at 84° F (Asplen et al.). Adults emerge soon after pupation, and begin the next generational life cycle. Using 43° F as a lower threshold, the average developmental period for SWD eggs, larvae, pupae, and adults are 20, 122, 93 and 1,050 degree days, respectively (Kinjo et al.). Figure 4. SWD infestation development within cherry and blueberry. (a) Initial oviposition, (b) Larval development, (c) Pupation partially visible on fruit, (d) Intact fruit, (e) Partially sunken fruit indicating larval development, (f) Degraded fruit. Red arrows indicate location where SWD eggs were laid. Photo credit: M. Hauser, California Department of Agriculture and A. Sial, University of Georgia. SWD presence in the field is dependent on environmental conditions. In geographic regions where temperatures rarely fall outside of developmental limits, SWD can be detected year-round. However, areas that experience midsummer highs above 90° F can expect SWD presence to fall during that time. Conversely, regions where winter temperatures are consistently below freezing will not typically support SWD, though occasional winter morphs (late-season SWD thought to be more cold tolerant) have been caught in Wisconsin and Minnesota as late as December. Whether these morphs are surviving in shelters or benefitting from an occasional milder winter has yet to be determined. Another open area of research is determining whether summertime SWD in northern regions are primarily overwintering, or migrating from more southern regions where winter temperatures are not fatal. Lee et al. (2011) observed that most small-fruit crops become susceptible to SWD as they begin to turn color. If left unchecked, growers of mid-to-late season crops such as late season blueberry and primocane fruiting raspberry can expect up to 100% crop loss. Crop losses due to SWD have been estimated to cost up to $500 million annually in the western United States alone (Goodhue et al., 2011). Controlling SWD on farms is difficult due to their short generation time, wide host range, lack of natural predators, and even their hearty immune systems. Organic growers face an especially hard task, being constrained to control practices that are organically approved. This portion of the article will document current research and best practices for monitoring and controlling SWD in organic systems. Proper SWD management first requires knowing when they are present on the farm. The most common method for detecting SWD presence is trapping. SWD traps are commercially available but can also be made by hand. Most traps consist of three parts: a perforated container, a lure to attract SWD inside the container, and soapy water that SWD will eventually drown in. Many commercial lures are organically approved and hang above the liquid inside the container, but homemade lures are also commonly made. Lure recipes involving yeast, apple cider vinegar and sugar dissolved in the trap water are available online. Figure 5. Commercial SWD trap hanging in St. Paul, MN. Photo credit: Andrew Petran. Traps are typically checked once a week. Depending on the trap type, this will involve inspecting sticky cards for SWD or draining the liquid through a filter to separate the caught insects before inspection. The liquid is commonly replaced during this time as well. SWD traps are important because they indicate when the pest is first present on the farm. However, once SWD presence has been determined, the usefulness of traps likely diminishes. There is little to no current data consistently linking SWD trap numbers to total presence in the field or fruit infestation levels (Asplen et al., 2015). This is confounded by the variable effectiveness of trap types and environments, making it difficult to establish trap threshold standards. Additionally, there is no evidence that SWD traps are an effective method for reducing overall SWD populations in the field. Thus, the labor and economic costs of maintaining SWD traps after their presence is first determined may be more than the potential benefit of leaving them for the extent of the season. Note that SWD traps are not the same as attract-and-kill devices, a new possible management technique that will be discussed later in the document. Phenology management, or avoidance through early management, requires knowing when SWD first arrives in an area, and is thus informed by trapping. Essentially, this technique embraces the philosophy of ‘if you can't beat them, avoid them’. 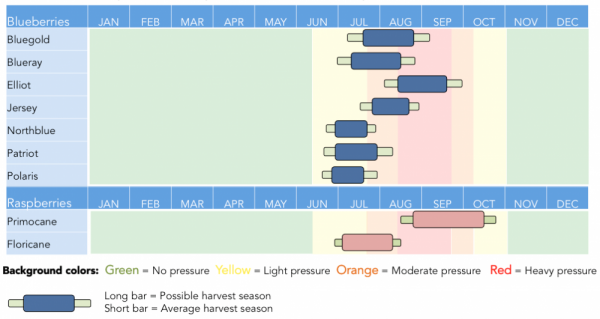 If a grower lives in an area where SWD is not present year-round, they may have the opportunity to grow crops with a fruiting window that does not correspond with peak SWD season. For example, a grower in southern Minnesota can plant early-season blueberries that mature in early July. Even though this fruit is susceptible to SWD infestation, they can harvest relatively risk free because SWD doesn't appear in high numbers in this environment until harvest is ending (Fig. 6). Figure 6. SWD presence and severity, along with common fruiting windows of several blueberry and raspberry cultivars in the Upper Midwest. Figure by Andrew Petran. Note that phenology management will be more effective in areas where SWD populations vary over the year. Regions where SWD is present year-round will likely not benefit from this practice. SWD presence by region is outlined in Asplen et al. (2015), or can be determined by SWD trapping or contacting a local extension agent. Read the label to be sure that the product is labeled for the crop and pest you intend to control. Make sure that the brand name product is listed in your Organic System Plan and approved by your USDA-approved certifier. Organically-approved spray options for SWD control are limited, both in availability and effectiveness. A two-year, multi-university study funded by the OREI observed Entrust® SC as the most effective spray for SWD control, with Grandevo® also showing effectiveness controlling 3rd instar larvae within infested fruit (Fig. 7). Products known as adjuvants can be mixed with insecticides to increase their efficacy. These products may influence the effectiveness of sprays on SWD. Figure 7. (a) Adult SWD mortality after being exposed to leaves containing insecticides immediately after spraying (blue bar), 3 days after spraying (orange bar) and 5 days after spraying (grey bar). (b) SWD Larval presence after fruit is exposed to insecticide treatments. Figures available on eOrganic webinar for organic management of spotted wing drosophila. Current research is attempting to identify novel sprays and application strategies that are effective at controlling SWD in the field. This includes the use of biochemical pesticides that display reduced toxicity on pollinators, and non-nutritive sugars that may lead to increased SWD mortality. Attract-and-kill pest management tactics utilize attractants to bring a target pest into contact with a killing device, including traps. While SWD traps are useful for detecting initial SWD presence in the field, using them for management is difficult as multiple hundred traps per acre may be required. Attract-and-kill (AK) devices that work by luring SWD to an insecticide or other killing method may provide a lower maintenance approach for reducing SWD populations and thus infestation. They offer advantages over traditional spraying that include less pesticide use, pesticides being concentrated on the device instead of plant material or fruit, and combining the insecticide with attractants to promote oral intake. One SWD AK device being evaluated is the attracticidal sphere. Laboratory and field trials have shown SWD have a strong preference for red-colored spheres (Rice et al., 2016). The devices consist of a hemispherical plastic base capped with a wax/sugar/insecticide mixture (Fig. 8). In laboratory trials, SWD that came into contact with spheres loaded with Entrust® for 5 minutes experienced 80% mortality, with 100% mortality after 24-hr exposure (Rice et al., 2017). The goal is to have commercially available attracticidal spheres in the future. Figure 8. SWD AK devices (a) close up with SWD, and (b) deployed in the field. Photos by Kevin Rice, USDA-ARS. More information on SWD AK can be found on the eOrganic webinar for organic management of SWD. Environmental research has observed that SWD are most active at dawn and dusk, preferring to stay in cool, moist, and shady areas during the day (Asplen et al., 2015). The interior plant canopy of most fruit crops can provide this environment, possibly making it easier for SWD by hiding within the very plants they infest. Research is underway to determine if intensive pruning techniques can alter the microenvironment to be less beneficial for SWD, thus reducing infestation. Research is being conducted in multiple states on blueberries, blackberries, and raspberries with three major pruning treatments: a grower standard prune, a light prune with ≈25% more canopy coverage, and a heavy prune with ≈25% less canopy coverage (Fig. 9). Figure 9. Pruning treatments on Minnesota blueberry plants. Photo by Andrew Petran. Another possible advantage of pruning is the effect it may have on other control methods, such as spraying. By reducing the total canopy area, heavier pruning could allow sprays to penetrate further into the interior of the plant, where SWD are known to typically gather during the heat of summer days. As discussed earlier, fruit infested with SWD often falls to the ground before adult emergence. This can make sanitation difficult, but it also allows the opportunity to examine floor management as an SWD control technique. In 2016, the OREI SWD project researched the effects of different mulch types on within-fruit SWD development. Artificially-infested blueberries were placed in different mulch treatments (plastic landscape fabric, and organic mulching material such as wood chips or sawdust, depending on location) and analyzed for adult emergence in Oregon, Minnesota, Georgia, and Michigan. Berries were placed both on top and underneath the surface of each mulch type. 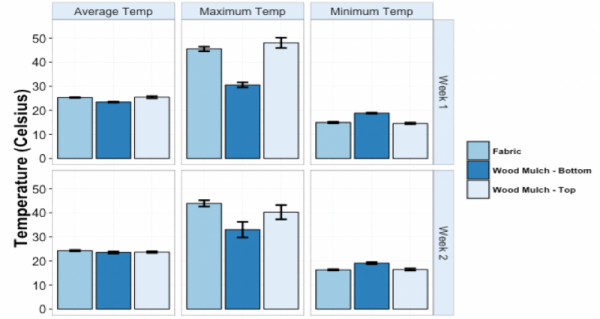 It was observed that maximum temperature conditions underneath the surface of mulching materials were less than the maximum temperatures observed on top (Fig. 10). Correspondingly, these treatments also had higher levels of SWD emergence from fruit. Figure 10. Average, maximum, and minimum temperature conditions of mulch treatments in Minnesota blueberry fields. Two 1-week trials were conducted. If 2017 results are similar, these findings can help growers make more informed cultural practice decisions for SWD management. For example, infested fruit that falls onto black landscape fabric can be exposed to temperature conditions that inhibit adult SWD emergence. Also, a 2016 survey revealed that growers sometimes bury fallen fruit as a sanitation practice. However, these results imply that such a practice provides infested fruit with more ideal developmental conditions, and may actually increase SWD emergence and presence on the farm. SWD exclusion can mean completely enclosing a crop in plastic or a fine mesh insect netting, but often involves both—constructing a plastic-covered high tunnel around a crop, and covering any entrances, exits and ventilation holes with insect netting that SWD cannot pass through (Fig. 11). This mesh can be found through several commercial sources. Nets with tighter weaves are often heavier and exclude more insects; 80-gram insect netting is recommended for excluding SWD. Figure 11. Miniature plastic high tunnels capped with 80g insect netting on either side, Morris, MN. Photo credit: Andrew Petran. Exclusion management has been shown to effectively reduce SWD presence and infestation of small fruits, even compared to conventional control options. In 2015, exclusion practices in Minnesota reduced SWD infestation of fall-bearing raspberries to ≈2%, compared to 80% infestation in uncovered plots, and 61% infestation in uncovered plots treated with conventional insecticides (Rogers et al., 2016). Netting has shown similar effectiveness in reducing SWD in blueberry (Cormier et al., 2015). 2016 OREI exclusion research conducted on raspberries, blueberries and blackberries in Michigan, Arkansas, and Minnesota all observed higher temperatures and lower humidity inside exclusion tunnels. These tunnels also had significantly lower SWD infestation and higher marketable yields compared to uncovered controls (Figs. 12a & 12b). Figure 12. (a) SWD presence in exclusion and non-exclusion blueberries in Michigan, 2016. (b) Total yield and % marketable fruit of different blackberry exclusion treatments in Arkansas, 2016. Poly-covered tunnel refers to tunnels completely enclosed in plastic alone, whereas netted tunnel refers to complete enclosure in exclusion netting. While OREI research has observed only increases in marketable yields in exclusion settings, there is a concern that exclusion techniques can reduce potential yields by restricting pollinator access to crops, in addition to SWD. A recently funded project by the Minnesota Department of Agriculture is researching the effect of introducing commercial bumblebees within exclusion tunnels for fall-bearing raspberry. Like most invasive pests, SWD is a problematic insect in the United States. Its broad host range and lack of native predators make it a threat to fruit growers throughout the country. Organic control options are limited, but this article documents current research efforts and outlines various ways that growers can limit SWD presence and infestation on their land. This includes choosing crops whose fruiting phenology does not match up with SWD presence in their area, wise use of organically-approved sprays and attract-and-kill devices, employing plastic or fabric mulch to inhibit the development of infested fruit that has fallen on the canopy floor, and using exclusion tunnels to create a physical barrier between the crops and SWD in the field. Even more innovative research is being conducted on organic SWD control, so check the Organic Management of Spotted Wing Drosophila website for updates! Asplen, M. K., G. Anfora, A. Biondi, D.-S. Choi, D. Chu, K. M. Daane, …N. Desneux. 2015. Invasion biology of spotted wing Drosophila (Drosophila suzukii): A global perspective and future priorities. Journal of Pest Science 88:469–494. Available online at: https://doi.org/10.1007/s10340-015-0681-z (verified 16 Nov 2017). Cormier, D., J. Veilleux, A. Firlej. 2015. Exclusion net to control spotted wing Drosophila in blueberry fields. IOBC-WPRS Bulletin 109:181–184. Available online at: https://www.researchgate.net/profile/Annabelle_Firlej/publication/273458102_Exclusion_net_to_control_spotted_wing_Drosophila_in_blueberry_fields/links/5503304c0cf24cee39fd635f.pdf) (verified 15 Nov 2017). Goodhue, R. E., M. Bolda, D. Farnsworth, J. C. Williams, and F. G. Zalom. 2011. Spotted wing drosophila infestation of California strawberries and raspberries: Economic analysis of potential revenue losses and control costs. Pest Management Science 67:1396–1402. Available online at: http://onlinelibrary.wiley.com/doi/10.1002/ps.2259/abstract (verified 16 Nov 2017). Hauser, M. 2011. A historic account of the invasion of Drosophila suzukii (Matsumura) (Diptera: Drosophilidae) in the continental United States, with remarks on their identification. Pest Management Science 67:1352–1357. Available online at: https://doi.org/10.1002/ps.2265) (verified 15 Nov 2017). Kinjo, H., Y. Kunimi, and M. Nakai. 2014. Effects of temperature on the reproduction and development of Drosophila suzukii (Diptera: Drosophilidae). Applied Entomology and Zoology 49:297–304. Available online at: https://doi.org/10.1007/s13355-014-0249-z) (verified 15 Nov 2017). Lee, J. C., D. J. Bruck, H. Curry, D. Edwards, D. R. Haviland, R. A. Van Steenwyk, and B. M. Yorgey. 2011. The susceptibility of small fruits and cherries to the spotted-wing drosophila, Drosophila suzukii. Pest Management Science 67:1358–1367. Available online at: https://doi.org/10.1002/ps.2225) (verified 15 Nov 2017). Rice, K. B., B. D. Short, S. K. Jones, and T. C. Leskey. 2016. Behavioral responses of Drosophila suzukii (Diptera: Drosophilidae) to visual stimuli under laboratory, semifield, and field conditions. Environmental Entomology 45:1480–1488. Available online at: https://doi.org/10.1093/ee/nvw123) (verified 16 Nov 2017). Rice, K. B., B. D. Short, and T. C. Leskey. 2017. Development of an attract-and-kill strategy for Drosophila suzukii (Diptera: Drosophilidae): Evaluation of attracticidal spheres under laboratory and field conditions. Journal of Economic Entomology 110:535–542. Available online at: https://doi.org/10.1093/jee/tow319) (verified 15 Nov 2017). Rogers, M. A., E. C. Burkness, and W. D. Hutchison. 2016. 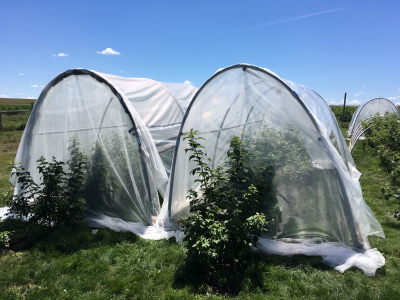 Evaluation of high tunnels for management of Drosophila suzukii in fall-bearing red raspberries: Potential for reducing insecticide use. Journal of Pest Science 89:815–821. Available online at: http://dx.doi.org/10.1007/s10340-016-0731-1 (verified 16 Nov 2017). Takamori, H., H. Watabe, Y. Fuyama, Y. Zhang, and T. Aotsuka. 2006. Drosophila subpulchrella, a new species of the Drosophila suzukii species subgroup from Japan and China (Diptera: Drosophilidae). Entomological Science 9:121–128. Available online at: https://doi.org/10.1111/j.1479-8298.2006.00159.x) (verified 15 Nov 2017).